They quickly realised that their mutual enthusiasm for technology, programming and self development was unrivalled and have thus remained the best of friends. Around last Christmas break we decided to take action. It is important to take that first step, it’s also the hardest part. Don’t expect your first iteration to be perfect. In fact perfectionism might be your biggest enemy. Looking back we made a lot of decisions on the fly, you simply can’t plan for everything in advance. Like writing an article: you have an outline, yet the meat of the story presents itself while writing. Find a success buddy: there are few things as powerful as two people locked arm and arm marching forward the same goal. To up your chances of success, get a success buddy, someone who’ll keep you accountable as you cement your new habit while you return the favor. Based on prior good experience with Jekyll and Github Pages (git + performance), we decided to use a static site generator. To keep it Python we forced ourselves to use and learn Pelican. We used an existing Pelican theme. Terminal (Vim), markdown, Git(hub), we felt right at home. At the start you are just writing, building up a content base. It is hard work and you have to persist. There is no shortcut. You will see a few visitors a day, no comments, no shares, it gets pretty lonely at times, self doubt might kick in. The majority give up at this point but, if you stick with it consistently eventually you will get noticed and traffic starts to flow in. We posted the initial idea to Hacker News (appropriately using ‘Show HN: ...’) and got some positive feedback. After a while we recognized that a lot of developers were stuck in the between-Beginner-and-Intermediate stage, so we wrote a Python resources post which got a lot of upvotes on the learnpython subreddit and got featured on the Python Bytes podcast. If you get it wrong, you learn even more. Anybody performing on stage gets criticized at some point, it goes with the territory. It is hard to please everybody, nor should you want that. We wanted our blog to be original which meant not limiting ourselves to just articles. We cannot exactly recall how the code challenges came about, but we needed a vehicle to learn and it didn’t seem prevalent elsewhere. We inquired HN again and people seemed interested. Our weekly code challenges (140 forks at this writing) turned out to be a great way to learn from each other, and it is adding an interesting dynamic to our site and brand. Brand? Yes. That is the advantage of starting a blog: to help create your brand. We recommend reading Soft Skills for practical advice how to market yourself. In our second month we hired a designer to make an attractive logo and this really gave PyBites its unique flavor. We became more active on social media. We reached out to fellow Pythonistas. We got invaluable feedback from our readers. We gained quite some traction from Reddit’s learnpython (and grew some thicker skin!). The number one focus should be content. We write our articles with great care. We try to come up with interesting and varied code challenges. We want to develop our own style and voice. 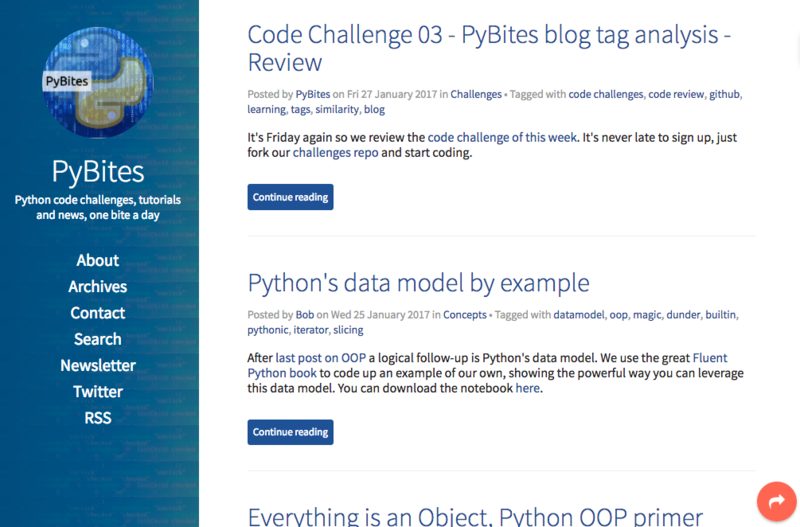 To keep the momentum we also commit to a certain weekly volume of work: one code challenge, two articles, and a news digest. To allow us to focus on the important, automation is key. Although we manually craft our newsletter we get the article links via a cron script. We parse Planet Python, emailing a daily digest to keep up2date. We auto-tweet our daily script for our 100DaysOfCode challenge we are doing these days. We use a tool to assist in creating our weekly Twitter news digest. We have automatic featured images on our posts (red = challenge, blue = article, green = news, purple = special occasion). Code challenge participation has a process. 4 months in PyBites is pretty streamlined and that makes things more consistent and compounds to saved time we can use to focus on what matters: the content. 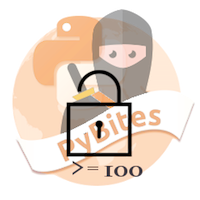 PyBites made us push the envelope resulting in significant Python learning in the last 4 months. From mastering important concepts of the language to building useful utilities using Pythonic code. If it was not for the blog we would not have had this kind of drive, inspiration nor tooling. From the start we decided to do a weekly newsletter, growing our following. The number of page views only tells you so much. 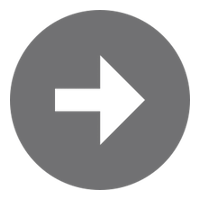 What you really want is returning visitors and loyal followers that want to read your content every week and can provide you with useful feedback. We want to build a community of passionate Pythonistas that want to learn with us (both directions). With this sort of momentum, we only can go forward. With such positive results we are pretty stoked to continue to learn Python inside-out sharing our progress and to keep growing our community. If you like this article we ask you one favor: send this to a friend or co-worker. Identify something that passionates you and partner up with somebody to start creating a blog, open source project, or some other platform to share your learning. There is no better way to hone your skills than daily practice and holding each other accountable. We’re eager to hear from you so leave a comment below to share your story / feedback. We hope this article has inspired you to take action. We hope it convinced you that starting a programming endeavor is not that difficult if you are willing to put in consistent hard work. Besides, helping other people get better is highly rewarding in itself and is an invaluable skill in your developer toolkit. Good luck!